The following is a list of reviews sent in by previous customers for El Vista Auto Sales. If you have had an experience with El Vista Auto Sales that you would like to share, Click Here to Add Your Own Testimonial. 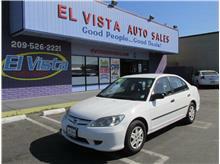 Review: I bought an economy car from El Vista Auto and I am very satisfied with my purchase. Staff is friendly, so I recommend checking it out during your buying experience.